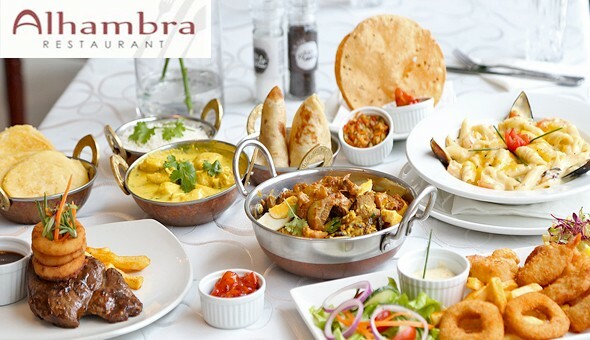 DealZone | 34% discount deal in Cape Town - An Exclusive 2-Course Gourmet Dining Experience for 2 People at Alhambra Restaurant! Dine on the likes of; Seafood, Steak, Lamb Biryani, Butter Chicken Curry, Chocolate Brownies, Waffles, Sticky Toffee Pudding & More! An Exclusive 2-Course Gourmet Dining Experience for 2 People at Alhambra Restaurant! Dine on the likes of; Seafood, Steak, Lamb Biryani, Butter Chicken Curry, Chocolate Brownies, Waffles, Sticky Toffee Pudding & More!